If you’ve ever dreamed of owning a horse, a Miniature Horse could be your dream come true. Whether you are a first-time horse owner or a veteran breeder, the modern American Miniature Horse is an excellent breed for a variety of reasons. These are great animals for both the young and old to raise, as they make fine companions and beautiful show creatures. The Florida State Fair recently hosted a Miniature Horse Show that was absolutely delightful for the whole family. Here are five fun reasons to own one for yourself. Kids love Miniature Horses. Standing no taller than 34” at the base of the mane, these wonderful creatures are the perfect size for children. Many children love horses and are excited by the prospect of raising one, but can be easily intimidated by such a large beast. It can be difficult for a young child to handle the necessary grooming needed to keep a standard size horse healthy and happy. Miniature Horses are a perfect solution to this, as they are simply the perfect size for a child to manage with little to no assistance. Foals are particularly adorable, as they stand a mere 16” to 21”. Miniature Horses are versatile animals. Just like their larger counterparts, American Miniature Horses have their own personalities that make them suitable for different owners. You may enjoy the challenge of raising a more spirited animal for shows and competitions, or maybe you just want a sweet, calm horse to enjoy pleasure driving with. The American Miniature Horse Association maintains a website, which can help you locate farms, clubs, and businesses to assist you in finding the perfect horse for your needs. A smaller animal means less mess. Raising a horse can be expensive, but raising a Miniature Horse can cost significantly less. The smaller breeds are going to consume much less food— and create less waste! This makes the American Miniature Horse a cost-friendly alternative to standard size horses. They also require less space, so you don’t need the large barn or stable that a bigger animal would require. A nice shed with sufficient airflow is a perfect home for a Miniature Horse. American Miniature Horses are good investments. 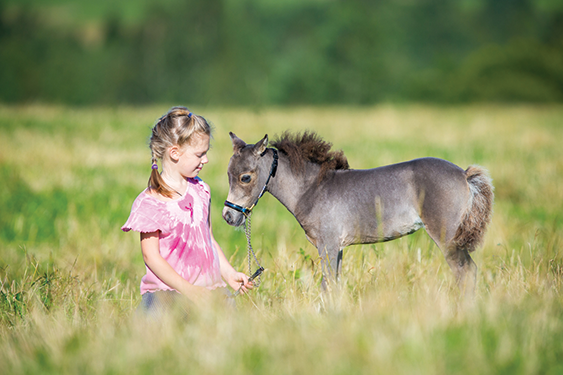 When you purchase a Miniature Horse, take the time to ensure that the animal is registered with the AMHA, and have the ownership properly transferred to your name. American Miniature Horse foals that are of good quality and certified bloodlines tend to command good prices. As Baby Boomers retire, it is expected that the demand for these animals will continue to climb. Your beautiful companion could turn you a tidy profit through its offspring. Miniature Horses make excellent therapy pets. The use of Miniature Horses as therapy animals is increasing. Pet Partners is one company that makes use of the Minis to visit individuals with a variety of medical issues. Volunteers with their Miniature Horses help those struggling with loneliness, anxiety, pain, and other problems. A growing body of research is showing that this type of therapy has very positive results. Not every horse is suited for this type of work, but if you have a Mini that is friendly and open to meeting and interacting with new people, this can be a very fulfilling project to undertake. It is a way to bond with your own animal while making a positive difference in the lives of those who need it. The American Miniature Horse is the fun-size version of the classic, stately equine. By doing some research, you can find a horse that perfectly suits your needs and personality. They make wonderful companions, show animals, and therapy pets, providing you with a wide range of options for interacting with your horse. Plus, their small size makes it easier to care for them. All in all, these horses are a delight to watch and to own. If you missed the show at the Florida State Fair, be sure to look for these treasures at other local horse shows. You can find horse shows and other information at amha.org.